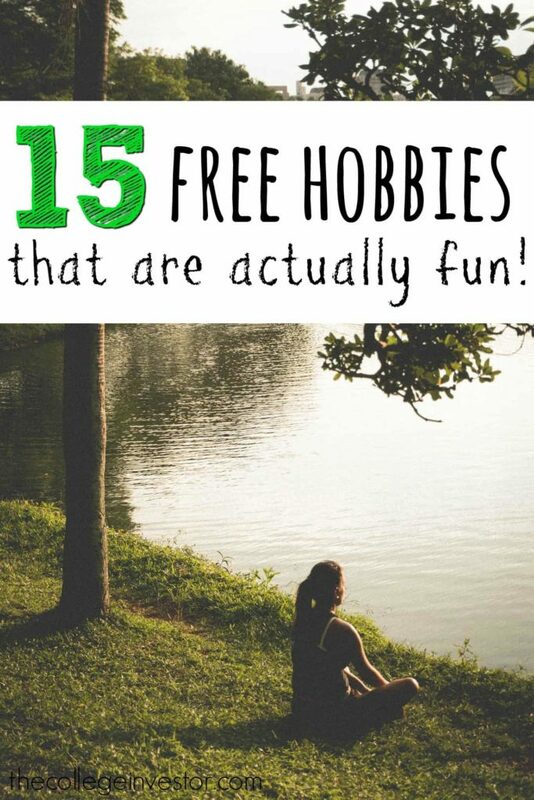 Home » 15 Free Hobbies That Require No Money But Are Fun! I'm a huge proponent of earning more to achieve your financial goals. But, at the same time, I don't dismiss the need to save money or be conscious of your spending. However, for many people (myself included), it can be hard to balance having fun with saving money. Too many people think "a good time" requires dropping $50-$100 for dinner and drinks, or going to a movie in the theatre for $35 with popcorn and a soda. That's just not the case - there are plenty of free hobbies that you can do. Yes free. As in cost $0. And they are fun, entertaining, can occupy your time for hours at a time, and you'll enjoy it. Writing...putting pen to paper...or even typing on the computer screen. Writing is a great activity that anyone can do for free. It might not sound enjoyable, but it can be - when you realize there are so many different forms of writing and ways to do it. You could write a story, you could write a poem, you could write a journal, you could write a letter. You could write reviews of every place you visit. Just like with any creative medium, there are pretty much limitless ways to get started writing. So that, in itself, could be overwhelming. Offline: Get started with a notepad and pen and start writing. Get your thoughts on paper until you get comfortable writing. No matter the subject, just write. Some experts advise trying to write a page a day just to build the habit and get started. Want to kill time, do something enjoyable, and maybe get or stay fit? Well, get outside and start walking or hiking. This is completely free, and there are limitless places you can go. To start, just open your front door and start walking around your neighborhood. Once you get a comfort level up for time and distance, consider a local park or trail. If you want to add an extra spin to hiking, look into geocaching. Geocaching is essentially an outdoor treasure hunt. People place caches around different trails and points of interest, and other people go find them while hiking. It can be pretty fun and make hiking rewarding. I've talked about reading before, but too many people don't realize that reading can be a free activity. Seriously. If you haven't considered reading for a free hobby, now is your chance. 1. Go To The Library. Your library has almost every book imaginable and you can get a library card and read them for free. You could also just sit in the library and read. Basically, you have no excuse for not reading with your local library. 2. Read Online. Maybe reading a book isn't your think (it's not mine). But I read voraciously - news articles, blogs, journals, and more - just online. There is no bigger free source of literature and reading than the Internet. Just open your web browser and start reading. Don't know where to start? Try Wikipedia. On their Main Page each day, they have multiple interesting articles that can be a great jump start to your reading hobby.​ Oh, and if you don't have Internet, go back to your library - most (if not all) have computers you can use for free. Exercising and physical fitness is another hobby that too many people believe requires spending a ton of money. It doesn't help that financial ​pundits (including myself) consistently talk about over-priced gym memberships that go unused. But, in practice, exercise and physical fitness can be completely free. In fact, I personally think working out without a gym is the way to go for most beginners (the gym can be overwhelming). There are various ways to exercise without going to the gym​, and it all falls into a bucket called bodyweight fitness. These include exercises like running, pushups, sit-ups, pull-ups, and more. You can find tons of great ideas and workouts on sites like Reddit's Bodyweight Fitness subreddit. ​Another fun hobby can be learning another language. It used to be expensive to learn languages - you'd need to take a class or pay a tutor to help you. However, today, it's free and you can make a lot of progress by yourself if you put in the effort. The important thing to remember is that learning a foreign language can be both a free hobby that's fun, and a useful way to empower your future. What to have a hobby that also contributes and gives back? Volunteering is the way to go. So many organizations are looking for great help - there are nearly limitless ways that you can spend your time giving back. It's important to remember that volunteering can be both structured and unstructured. You can volunteer and be part of an organization, or you can simply dedicate some time yourself to give back. For example, you could volunteer at your church or local food bank. Or, you could simply spend several hours a week picking up trash at your local park. United Way: United Way is a nationwide organization that partners with local charities to give back. They can connect you with local organizations look for help. Beach Clean Up In A Box: Can't make it to a beach clean up? Organize your own with this helpful tool to get all the supplies you need in a box. Singing can be another great hobby that doesn't cost you anything but your time (and voice). The fun part about singing is that you can be as casual or formal as you want with it. For example, you could sing at home, in your car, or in the shower. That's causal. Or, you can take it up a notch and sing in a choir or group. Want to sing with friends? Go to karaoke ​a few times a week and practice. This is a fun one that you can do almost anywhere, as long as you have something to toss into the air. Juggling is hard. I can't juggle more than two things at once (if you even call that juggling). Because it's challenging, it can be a great free hobby. The more you practice, the more you can juggle. And trust me, people will be impressed. Origami is the art of folding paper. And it can be really impressive with practice. All you need to become an origami master is paper, and time. The great thing about this hobby is that it's free to learn and practice - you just need paper. And there are tons of free videos and resources that can show you exactly what to do. Drawing is another paper-based hobby that is totally free. All you need is something to write with - pencil, pen, crayon, chalk,​ anything! Beyond that, it's just your imagination. Now, you might equate drawing to beautiful works of art - but nobody starts there. To get started, just put pen to paper and see what happens. The great thing about drawing is that you can literally draw anything. You could go for realistic, or maybe you want to draw something of a fantasy world. You could go for people, or landscapes. Heck, maybe you want to draw a treasure map. Do you like puzzles? Are you into math or words? Did you get a newspaper subscription only to do the games page?​ Well, doing puzzles and crosswords is a fantastic FREE hobby. Yes free - you don't have to pay for a newspaper anymore to do your puzzles. You can do pretty much any puzzle for free online. Here's our list of free puzzles and crosswords. Looking at the stars, finding planets, checking out constellations, watching shooting stars! Looking upward is a lot of fun, and it's free. The hard part is getting started and knowing what to look for. The great thing about the Internet is that there are a lot of free tools and programs that can help you find constellations, planets, and more. One of my favorite tools for free astronomy is an iPhone app called SkyView. This app uses your GPS and orientation to show you exactly what starts and constellations you're looking at. If you don't have an iPhone, there are also free online star charts you can use from the Online Planetarium.​ Or search on YouTube - there are hundreds of videos out there showing you what to look for. Nature has a ton of beauty, and for those with a collector spirit, rock collecting can be a fun, free hobby. The hard part about collecting in general is that it can be expensive. Want to collect coins? Expensive. Want to collect art? Really expensive. But collecting rocks is free - a free hobby provided by nature. There is no set way to collect rocks. You can collect rocks you find beautiful. You can collect types of rocks. You can simply try to identify rocks and turn it into an educating experience. Meditation has been a huge buzz word in business the last few years. Many tech titans practice meditation or some form of mindfulness each day. Meditation can be a great free hobby that not only helps to clear your mind and focus, but can really be an enjoyable experience simply for fun. The idea that you focus, relax, and free yourself internally can have a lot of positive ramifications throughout your life. Finally, take advantage of your community's treasures. Every community is different, but this could be parks, trails, museums, art galleries, zoos, and more. Actually, the first 6 hobbies you mentioned, plus puzzles & crosswords are among my favorites! Writing is something I discovered I love only recently (a few years back). Walking, reading, puzzles and exercising are hobbies that stayed with me since childhood. I also love learning foreign languages, even though it takes a lot of time and effort. I’m currently fluent in 3, working on number 4 (I’d love to learn German. I already have some basic knowledge but never pursued it seriously).